For anyone who does not recognize the jargon of a Mary Kay consultant here is a breakdown. Warm chatter means stalk strangers and get them to listen to your line. Get referrals means have your friends give you names and numbers of more people you can harass. Book and hold skin care classes means talk a reluctant person into having one and then call them everyday up till the party to make sure they are still having it. Get a phone number from each guest so that they too can “hold a class” and get a phone call or text daily from you. Do not be pushy in Mary Kay terms just means do not resort to violence to get your bookings and try not to call after midnight. Be discreet in Mary Kay jargon means block your number on the phone so that your number comes up unavailable. Reach for the Stars means reach for your credit card. Dream Big means order big so I can keep my car and unit. It’s only $100 to start means until I tell you about all the inventory and events and supplies and meetings and things you’ll have to spend money on. You can’t sell from an empty wagon means I still need more production this month to meet my quota! No quotas means there aren’t any, unless you want to be a sales director, but we won’t tell you there’s a quota until after you do all the work to become a director. Attend your unit meetings means pay money to sit at someone’s house after an already long day for 2 plus hours in a skirt or dress and tight pantyhose. You’ll get to stand and clap while someone gets a pencil because they ordered inventory. If you haven’t purchased anything for the week, you will not be getting a cute little 99 cent charm. If you spent at least $200 though you will get an awesome ribbon. Think and act positive means pretend you are always happy and doing well. When someone asks how business is say “GREAT” even if as you say it you are on your way to see your lawyer about filing for bankruptcy. Fake it till you make it is along the same lines. Don’t ever let anyone know how much money you’re losing at this so-called business. They might not sign up. Go to Seminar means use your vacation time from your normal job for an out of town Mary Kay pep rally. Prepare to pay for your trip. You will get to share a room with 3 other consultants! 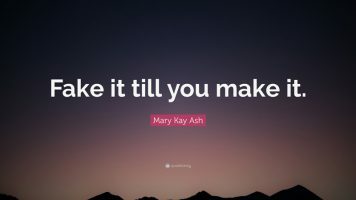 Time is money means do not waste time hanging out with non Mary Kay friends. They will only hold you back from being a Mega Star. Negative Nelly is someone who tries to burst your Mary Kay bubble by telling you the real facts and figures about Mary Kay. Don’t listen, because you’ll find out how slim your chances are for success. Mega Star is someone who spends “mega bucks” on cosmetics that they will not sell or use. “No” in response to a recruiting interview just means I need more information. Layering a potential recruit means calling and harassing periodically over a period of a year or two. You’ll break them down eventually! “Fake it till you make it” = lie about how well you are doing and go into debt to keep up the illusion. I”i it’s to be, it’s up to me.” = your director will blame you when you fail at a business plan that almost guarantees failure. It also hides the unpleasant truth that it’s not up to you – unless your recruits also recruit and buy and buy and buy you will not be seen as a success in Mary Kay. There are few rewards doe actually selling the product to lots of consumers. Fake it till you Make it” — this is one I disliked the most! From the start until I quit (abt. 2 1/2 yrs.) I was “faking it” all! Faith, Family, career….Except in reality, it’s career, career, career or buy inventory, spend on useless training or bankrupt your worried sick family. Training/conference/meeting etc… = rah-rah session for whatever the latest product is; spotlight time for some 20+ year MK vet to give her “story” on how she was sucked in and how it changed her life. There’s never any actual training on how to use anything or sell anything or create a better budget, or other business -savy things. Wanna know why? Let’s say each person spends $100 “wholesale”. Each one person only knows one other person. The same math principle applies using any number though. 1 recruit + 1 customer = (2x$100) $200 for MK Corp.
MK Corp. doesn’t benefit further from the recruit’s resale profit to her customer. Important! Turn that one customer into a recruit instead, who also recruits one, 5 deep. 1+1+1+1+1+1= 6 recruits 5 deep (6x$100) $600 for MK Corp.
1 recruit with 3 customers = 4 x $100 = $400 for MK Corp.
1>3>9>27>81>243+1=244 x $100 = $24,400 for MK Corp.
And that’s only with $100 orders! You get the picture. Ask yourself which scenario MK Corp. prefers? Start thinking of it from MK Corp perspective, and things become blatantly obvious. Affiliate perspective is part of the ruse. Not only do they know consultants retailing product 2x the price is difficult, they could care less what you do or make beyond your purchase from corp. They have their money – plus tax and shipping. Retail customers of consultants stop the chain of growth for any MLM corporation. And anyone can join an MLM without territories. It is detrimental to MK Corp. for the consultant to have retail customers vs. recruits. This is why all the focus is on recruiting to infinity. The illusion that affiliates are starting a “business” and becoming career women is how they rope you in. All you are is a big spending recruiting machine aka “the real customer” for MK Corp being trained to recruit other big spending recruit/customers. MK Corp. sales tactic: “Recruits” feel they have a vested interest, are easily brainwashed, feel empowered, are loyal to the brand, etc.. These types spend more “thinking” they are investing in their own business. LOL! Get the recruit to place big orders, and have her recruit others who do the same. Remember, you, the consultant, are nothing more than someone else’s recruit. Yep! Somehow they’ve convinced you that you are the head of your business. Amazing how they twist things so cleverly, isn’t it? MLMing is a way that makes the founders and top of the pyramid shysters rich – at your expense! Thinking like an affiliate in the context MK Corp. purposefully and deceptively present to you is a costly mistake. Those under the illusion just parrot the lie – some knowingly, some not. Now you know why MK doesn’t teach consultants how to “sell” product. “Faking it” is the mainstay of all MLMs. They teach it. “PRETEND IT’S TRUE…” That’s the one I love more: I have no moral in order to lie people. How can I work with this big lie? I can’t say so easily to my people ’cause I don’t like they lie to me. All is false and “plasticky” I dont have any moral either to use these pink trashy creams in my beautiful skin. Please dont be sick to use mk trash.